Graphics tablets go by a variety of names'digitizer tablets, pen tablets or touch tablets. By any name, what they do is go where no mouse has gone before'they let users input drawings, tracings or sketches into a computer. Altek's Datatab I has a backlit active area of up to 42 by 60 inches and an accuracy rating that exceeds the Geological Survey's U.S. National Map Accuracy Standards. It's priced at $4,295. These specialty input devices have been geared toward graphics, mapping and computer-aided design. But the appearance of sub-$100 graphics tablets has opened the market up to a wider audience, according to the research company Venture Development Corp. of Natick, Mass. Now they can be used for sketching, inputting digital signatures and making annotations. And the growth in Web site design has increased the demand for professional grade tablets, Venture Development said. The research company predicts that shipments of graphic digitizer tablets will reach 481,000 in 2004, up from 207,000 units last year. Tablets are available in standard sizes, ranging from those with active areas of 4 inches by 5 inches to 12 inches by 18 inches. There are large-format sizes available for computer-aided design and mapping applications, with active areas up to 42 inches by 60 inches. Custom sizes also are available. Tablets come with transducers, typically a pen, stylus or puck'similar to a mouse. Each has a window with crosshairs for pinpoint placement and up to 16 buttons. Cordless versions are'available for most models. Small, low-cost tablets, priced at less than $100, are convenient primarily for digital signatures, handwritten annotations, sketching and painting. Typically, they come with drawing, painting, animation and handwriting software. Midrange models, with an active area of 6 inches by 8 inches to 12 inches by 18 inches, are often professional tablets used by graphics professionals and engineers for imaging, page layout and CAD templates. They cost from $400 to $1,000. GTCO CalComp's Drawing Board III tablet includes features such as a clearly defined active surface area with perimeter menu and clear overlay for securing templates and menus. It comes in two sizes, priced at $325 and $595. High-end, large-format digitizers, with active areas of 18 by 24 inches to 42 by 60 inches, cost $2,000 or more. They are used to produce and edit large drawings and tracings with high accuracy'as fine as three-thousandths of an inch'for CAD and mapping applications where precision and tight tolerance are required. 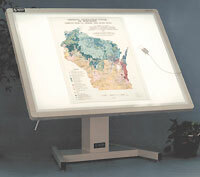 Large-format tablets are usually for engineering and geographic information systems work for which users enter data into a software application for research, analysis or archival purposes. The cream of the crop in graphics tablets are backlit, such as Altek's Datatab I, which lets a user digitize multiple layers instead of just one document at a time and offers adjustable backlighting to better highlight document details. Prices start at $4,295 for a 24- by 36-inch tablet with one-hundredth-of-an-inch accuracy. A few manufacturers also sell roll-up digitizers for users who work in the field or who are short on desk space. They are priced at about $2,000. Altek's ready-to-use, large-format flexible digitizer system has no setup menus to configure or dual in-line package switches to set and offers an excellent accuracy rating of within 15-thousandths of an inch. It can be rolled up and placed in a carrying case and rolled flat on any surface for use. The digitizer is priced at $2,295. GTCO CalComp Inc.'s roll-up digitizers come in three sizes'20 by 24, 30 by 36 and 36 by 48'and are used for cost estimating, CAD, mapping and GIS apps. They're priced at $1,795, $2,095 and $2,495, respectively, and come with a choice of pointing devices, including four- and 16-button MaxVu cursors. 'Accuracy and resolution. These specs are the primary indicators of performance. High accuracy is a rating of about five-thousandths of an inch to two-thousandths of an inch. 'Driver support. To ensure flexibility, check to see if the tablet offers Universal Serial Bus support. 'Ergonomic design. Take a look at how thick the tablet is when you're using it at the desktop, and check the footprint and make sure it feels comfortable when using it. 'Transducer styles. A variety of transducers, including four- and 16-button cursors, five-button mouse and pens, are available in both corded and cordless versions. Again, be sure they feel comfortable in your hand. Some tablets are customizable and expandable. For example, Wacom's Intuos line supports ToolID, which lets users customize their pens and use them as different tools. Some manufacturers offer Universal Serial Bus versions, which make it easier for users who work both on PCs and Apple Macintoshes. Most digitizers come with WinTab drivers, the universal driver standard that makes these and other devices compliant with Microsoft Windows software. For government employees who use MS-DOS or custom software, manufacturers usually have other ways to configure the digitizer or have special set-up packages. Beyond adding graphical capability, digitizers also can enhance productivity. By providing shortcuts through pull-down menus and icons, said Jennifer Sullivan, marketing manager for GTCO CalComp. 'With the built-in programmability of a digitizer and its cursor you don't have to go through all the pull-down menus and icons,' Sullivan said. You can program what you do most frequently right to the cursor button and access those commands, she said. Gina M. Roos is a free-lance computer journalist in Brewer, Maine.